It's Monday morning and Greek markets are tanking, down about 20%. 1. Greek market freak out: Greece's stock market reopened after being shut for more than a month due to the country's financial crisis. Traders started selling immediately and the overall market dropped by 23% in the first few moments. Shares in the country's big banks fell by about 30%. A bailout for Greece -- worth about 86 billion euros ($94 billion) -- has been agreed in principle with Greece's eurozone partners. But the finer details still have to be hammered out. Greek markets have been highly volatile this year. 2. 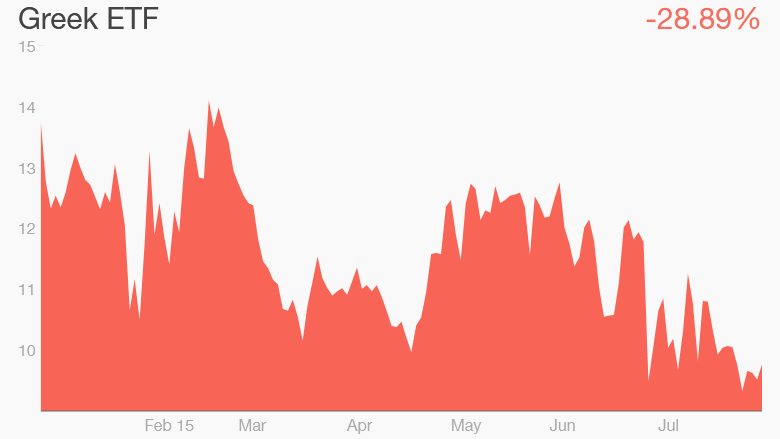 Another fall in China: Chinese stocks continued their recent move lower Monday. The Shanghai Composite dipped by 1.1% and the Shenzhen index dropped 2.7% after fresh data showed China's factory sector slumped in July. Chinese markets were the best performers earlier in the year, but have since come back to earth. The Shenzhen has fallen by about 35% since mid June, having soared by 120% since January. The weak manufacturing data from China is likely spooking oil traders. Crude oil futures are down by nearly 2% to trade around $46.40 a barrel. All Asian markets -- except for India -- dropped Monday. 3. 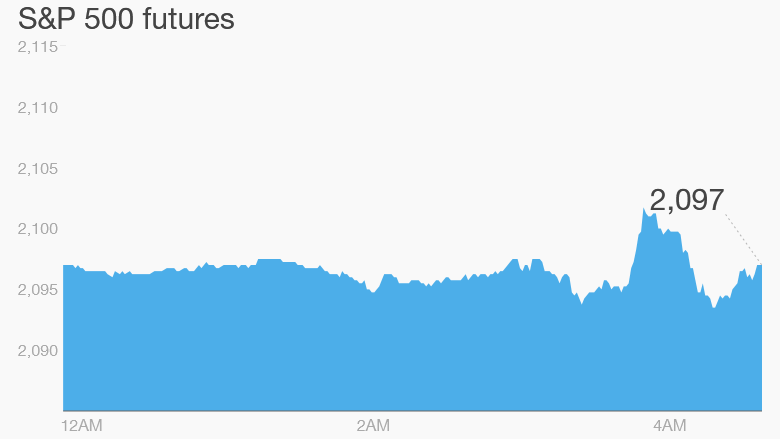 Other markets calm: U.S. stock futures are little changed Monday morning. European markets are mostly edging up in early trading, although London's FTSE is flat. 4. Earnings: Companies including Tyson Foods (TSN), Loews (L) and Frontier Communications (FTR) will report quarterly earnings ahead of the open. Allstate (ALL), Chegg (CHGG) and Denny's (DENN) are among the companies reporting this afternoon once markets are closed. 5. Economics: The Institute for Supply Management is reporting new July figures on the manufacturing sector at 10 a.m. ET. At the same time the Census Bureau will release data from June on construction spending. Throughout the day, automakers will report monthly car and truck sales for July.